Compiled by eminent scholars of biblical history, Carta's Illustrated Calendar of Biblical Times provides a comparative view of parallel cultures in the time of the Bible. Enhanced by contemporary artifacts and images, the time line gives both a general overview (from c. 3000 B.C. to A.D. 200) of the major historical events in the Ancient Near East, Palestine, Egypt and the West, and a detailed section, beginning from c. 1650 B.C., that highlights the biblical period and its rulers, kings, and prophets. 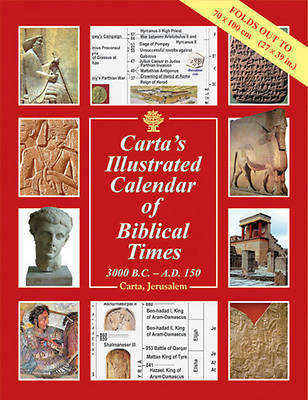 Carta's Illustrated Calendar of Biblical Times is perfect for Sunday School or homeschool classrooms.